There are no more dreaded words to the middle school parent than "I have a science project due." Every year through four years of middle school we have had to come up with two (one for each kid). The first couple are easy. But trying to come up with a unique project #8 that engages the kids is hard. The Internet is a great resource. Search for "science project ideas" and there are loads of folks who have shared their project ideas, making it easier for kids to select from a menu of potential projects. So, as a way of giving back, I want to, over time, publish some of the projects we have done so that others might benefit. The first such project I published was my son's science project to measure the Phoenix urban heat island. This project involves electro-magnetic propulsion. My kids really like the Rockin' Roller Coaster at DisneyWorld. Like many new coasters, this one uses a form of electro-magnetic propulsion to rocket the cars to 60+ miles per hour in just a few seconds. We decided to try to simulate this effect (note: there are several different approaches to electro-magnetic propulsion. The simplistic model we used is NOT the one used by coasters, but it is close enough for a 7th-grade science project). We first looked at building a simple rail gun, but some of the aspects of the construction were either dangerous or difficult (see here for an example of a simple one). In particular, the energy that needs to be stored in the capacitor is really too dangerous for 12-year-old kids. 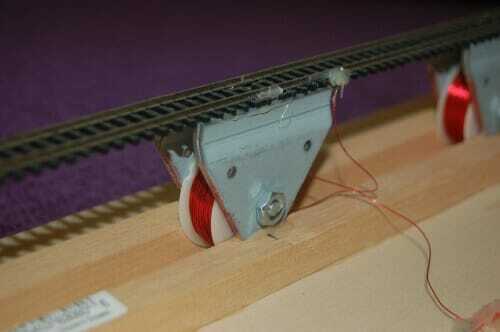 We decided instead simply try to roll a metal ball down a track, turning magnets off and on to move the ball along. We ended up being successful, though don't expect really high speeds (if you want cheap and easy high speeds with magnets and marbles, try this. We used the gauss gun for a different science project for a different kid in another year). The key is trying to turn the magnets on and off at the right time to propel the marble. We imagined a number of approaches using electric eyes and such, but that seemed really hard. Fortunately, as a model railroader, I had an answer. The marbles we were using rolled perfectly on N-scale track. 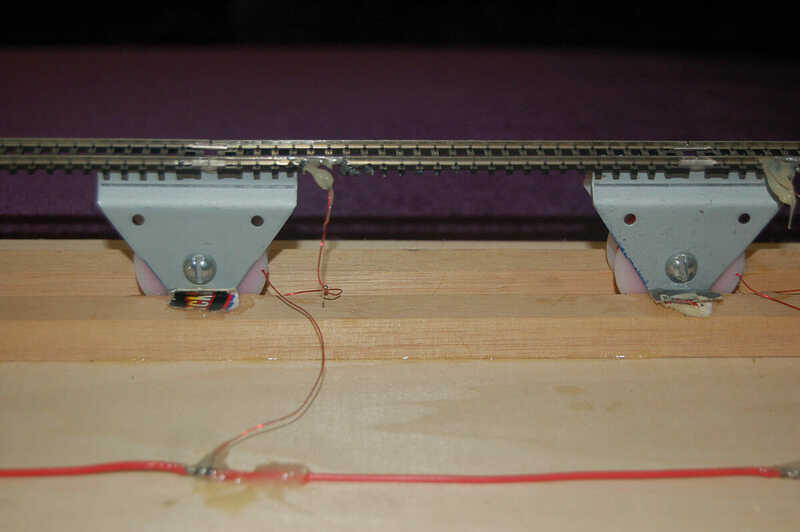 Since the marbles were also conductive, they could complete a circuit between the two rails (which is in fact how a model engine works). 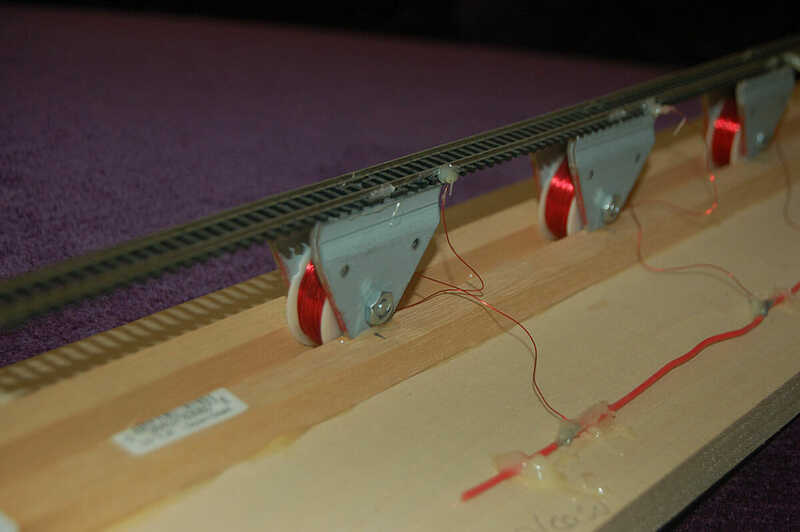 By putting electrical gaps spaced in the rails, as the ball rolled, it would progressively activate different rail sections. If each progressive section was wired to the next magnet, the marble effectively turns the magnets on and off as it rolls. The only thing that is missing is the power supply. The two red wires are connected to the positive and negative leads of a DC power supply. Here is a view from above. The magnets are also a model railroad part -- HO-scale uncoupling ramps made by a company named Kadee -- but other strong electro-magnets would probably work. Note that the magnet needs to create a wide field, which was why we used these. Hopefully you can see the principle here. As the ball approaches the magnet, it is completing the circuit to energize the magnet in front of it (ball is moving from right to left in this picture). Right over the magnet is a break in the track that isolates the track electrically from the next section. As the ball crosses this break, the magnet under it is turned off (preventing it from pulling backwards on the ball as it passes) and the next magnet in line is turned on. Potential Improvements: As mentioned above, I am not sure the correct position to switch power to the magnets is right when the ball is over a magnet -- some experimentation would probably yield a more optimal location. Also, I continually feared that performance was being degraded because the previous magnet was not turning off fast enough (due to inductance effects in the coil). If this is the case, then performance is hurt because the last magnet is still pulling backwards on the ball as it passes. Smart circuit makers could probably fix this with some electronics, or moving the changeover point earlier, before the ball is over the magnet, might help. I try not to impose too much of my personal life on this blog, but I couldn't resist showing off our weekend project. Anyway, this thing includes cookie bones (we used foil for molds for the bones and bat) licorice muscles, gummi worm brains and nerves, cake baseball, chocolate bat, and fondant hand and eye (with almond nails). Thank God for fondant - usually a smooth finish layer for cakes, it basically acts like edible clay. Move over Martha, coyote is here!